MONROVIA – Liberia’s prime democratic advancement institution, Naymote Partners for Democratic Development, has completed two in the series of three regional training workshops for 50 young emerging female leaders from 10 counties in Liberia including Lofa, Bong, Montserrado, Bassa, Margibi, Nimba, Bomi, Grand Cape Mount, RiverCess and Gbarpolu. The trainings were held in Gbarnga City, Bong County and Tubmanburg City, Bomi County. The workshops exposed participants to the fundamentals of good leadership including an understanding of the concept of gender, community needs assessment, the local government administration, teambuilding, and networking. Participants also learned about campaign planning, running an effective campaign and resource mobilization. The training employed participatory and reflective methods which included the used of audiovisual tools and documentaries. She described fear, lack of support, mentorship and limited access to education as barriers affecting women’s participation and motivated them to build partnerships and networks to strike a balance with their male counterparts for national leadership. Vice President Taylor also pledged her support to the mentorship program “Only people with passion do what they want to do and can continue despite the odds.”- Her Excellency, Chief Dr. Jewel Howard Taylor. 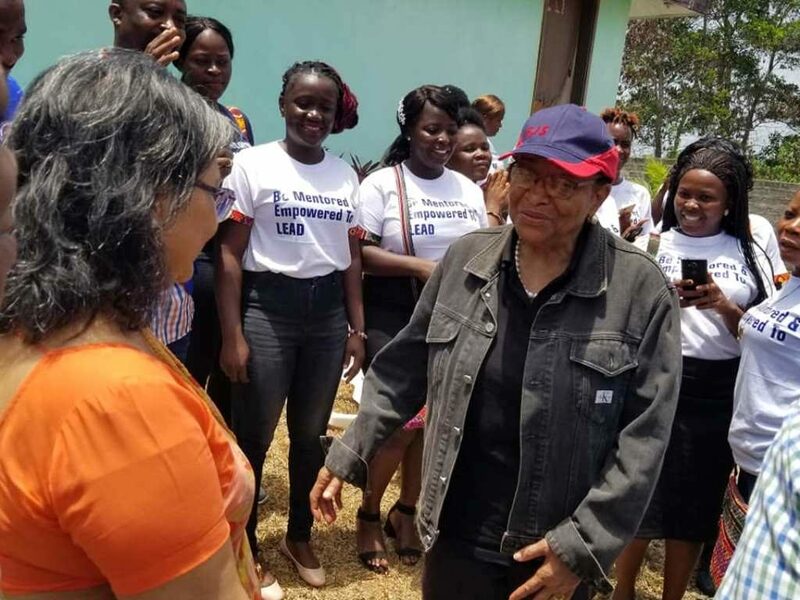 Africa’s most influential female political leader and Liberia former President Ellen Johnson-Sirleaf spoke at the second regional training in Tubmanburg, Bomi County, on March 22, 2019 where she shared her success stories through her political journey with the mentees in an interactive session. Madam Sirleaf underscored the need for women to set clear goals, vision, be prepared, focused, determined, consistent for what you want to be, very good at what you want to be. She entertained questions from the participants and explained how she was able to overcome her challenges turning them into success. Responding to participants, Madam Sirleaf described dishonesty, laziness and poor education system as some challenges during her 12 years of leadership and encouraged women interested in politics to be honest, hardworking, educated, knowledgeable of issues, be prepared to take risk and stand for what you really believed in. Both Vice President Taylor and Former President Sirleaf applauded UN Women for supporting NAYMOTE to implement such a great program and they pledged their support and commitment to support the project which they said is the best way for enhancing women participation, representation and leadership in Liberia. For her part, UN Women Deputy Country Representative, Madam Sangeeta Thapa described the number of women participation in national government as very low and highlighted the need for full participation of women in leadership and decision-making if the country’s development drive must be achieved. She further called for the collective efforts to ensure more women’s participation in national leadership and decision-making, characterizing the low participation of women in government as a national emergency that must be treated with urgency. The one-year Young Women Political Empowerment and Leadership Mentoring Program, is supported by the government of Canada through UN Women-Liberia, the program is providing mentorship and capacity building support for 75 young women across Liberia’s 15 counties grooming them for national leadership in the next 3, 5, 10 to 15 years. NAYMOTE believes developing the skills and knowledge of these young progressive women will help to overcome barriers and enhance effective participation, representation and leadership for a better Liberia.